Nina Flanagan is a clinical professor and director of the Adult-Gerontological Nursing Program at Binghamton University's Decker School of Nursing. She has more than 20 years of experience as a geriatric nurse practitioner in a variety of settings. Image Credit: Jonathan Cohen. Nina Flanagan is a clinical professor and director of the Adult-Gerontological Nursing Program at Binghamton University's Decker School of Nursing. She has more than 20 years of experience as a geriatric nurse practitioner in a variety of settings. Photography: Jonathan Cohen. 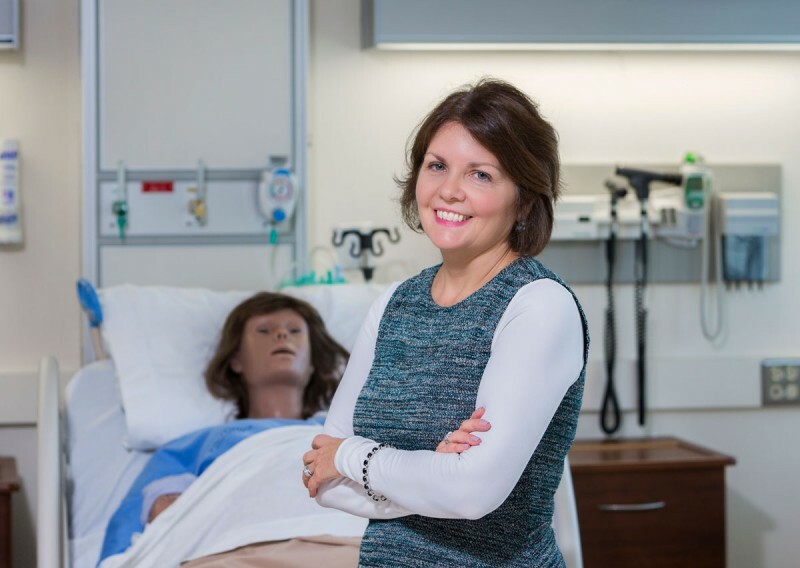 Positivity can transform the healthcare workplace, according to Nina Flanagan, clinical professor of nursing and program coordinator of the Adult-Gerontological Nursing Program at Binghamton University’s Decker School of Nursing. In researching the topic of positivity in the workplace, Flanagan discovered that a positive mindset is vital for maintaining a productive and enjoyable work environment, especially in the healthcare field. Throughout her experiences working at various healthcare organizations, Flanagan noticed the prevalence of negativity and its harmful effects on both leaders and staff members. Since healthcare is a demanding business that constantly changes, Flanagan said it is easy for people to become frustrated and stressed, which ultimately creates a negative work environment. However, Flanagan said it is imperative for people to alter their perspectives. “Our workplace environment feels unstable, and instability can invoke fear and anxiety. This affects the way we respond to change, but being positive and reframing these situations can help to decrease some of the fear and anxiety,” she said. Although it can be challenging to stay positive in such a difficult field, Flanagan said the power of positivity should emerge from leaders in the workplace, with the message being consistent and clear. “[Negativity] can easily become a culture wherever you are working. To me, it has to be shed from the top, it has to be a leadership initiative. It has to be something that’s expected and understood,” she said. From there, the positivity will spread to others and reinforce a better mindset. Flanagan suggests several tips to improve positivity in the workplace, such as offering positive reinforcement and transforming complaints into gratitude and solutions. These starting points can be applied to more than the healthcare field and offer ways for people to promote positivity. The article, “The Power of Positivity,” was published in Caring for the Ages.